The most important thing is honesty. Once you can fake that, you’ve got it made. Aristotle originally defined credibility as “trustworthiness.” If the audience doesn’t see you as sincere and truthful, you can’t expect them to accept your information or to take the desired action. But there’s more to credibility than being honest. A lot goes into having the audience perceive you as credible—and demonstrating to them that their perception is true. In this and future posts, I’ll be offering suggestions on how to build your credibility as a speaker. But first, let’s look at the components of ethos: how, where, and when credibility is built. Similarity: Can I relate to this speaker? Authority: Is this speaker someone I should listen to? Reputation: Does the speaker have experience or expertise in this subject? How much any given audience perceives these qualities is going to depend upon your relationship with them. Credibility is all about relationships. For example: with audiences who are familiar with you—say, your colleagues—you may already possess a certain amount of ethos. They may know you as an upstanding person (trustworthy) with whom they share certain workplace concerns and values (similarity). Perhaps you hold a senior rank (authority) or are known as an expert in certain subject matter (reputation). But what if your audience has never met you or this is your first time delivering the content? What can you say or do to quickly increase your ethos? The first place we often go to do so is the “credibility statement,” a literal declaration of your qualifications to speak on a subject, typically delivered in your introduction. This may include your personal experience, educational preparation, or your life-long interest in a subject. While important, the credibility statement is just one moment of ethos-building. 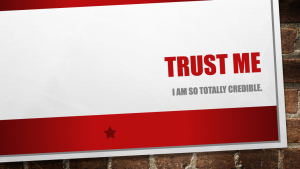 There are many more things you can—and should—say or do to boost credibility. And they occur not only during your presentation, but before and after it as well. Here are three simple examples, quick wins that go a long way in enhancing ethos. Here’s a comforting thought: as the designated speaker, trainer, or facilitator, you already have a certain amount of credibility that comes with your role. You are, after all, the one responsible for making this a successful and useful experience. You carry the promise of authority. Capitalize on this initial credibility and build on it by demonstrating that you take your responsibility—and your audience—seriously. Arrive early. Greet individuals as they arrive. Look for points of similarity with them in casual conversation. 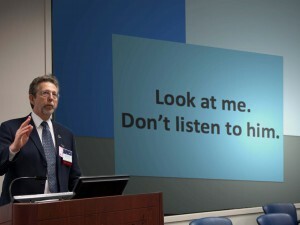 When someone mentions something that relates to your upcoming presentation, point out the connection and preview your excitement in sharing it. Thank individuals for attending. Be energetic, enthusiastic, organized, and professionally dressed. 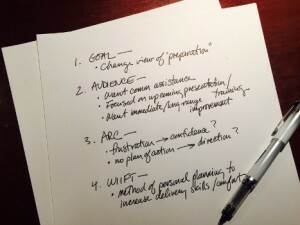 Demonstrate your effort to understand the audience’s world. Be inquisitive: ask questions about their work, their days, what is top of mind for them. Speakers typically use stories to engage audience imagination or emotions (pathos). But sharing a story also can contribute to your ethos—when the story is personal. Think about how often politicians—especially during campaign season—link issues to their personal experience. They may tug our heartstrings, but they’re also trying to show their personal connection to a message or topic. This establishes a certain authority and expertise on a subject; it also helps audiences identify—and increases the feeling of similarity. You don’t need to bare your soul; just bring what you know into your communication. It may be something as simple as what happened to you on the way to today’s session (if it relates to your topic). It may be a short anecdote that demonstrates a principle: how knowing your assistant’s DiSC style helped you give them the support they needed to succeed on a project. It may be sharing a personal reaction to the material: “The first time I heard this concept, it didn’t make immediate sense. But then I watched it play out in the workplace around me…” It may mean referring to past presentations or training sessions. 3. After you speak: make yourself available. Show you care about the benefit to the audience by making yourself available afterwards, whether for immediate questions and conversations or by sharing your contact information. Again, this not only shows your consideration for the audience; it gives you an added opportunity to demonstrate your expertise on a subject, adding to your reputation as a concerned thought leader. Like so many aspects of effective communication, credibility begins with understanding your relationship with the audience. From there, it’s a matter of deciding where you need to give your ethos a boost—whether by demonstrating trustworthiness, similarity, authority, or reputation. We’ll look at these—and other dimensions of credibility—in future posts. Until then: keep sharpening your overall presentation skills because ethos is built not only by what you say, but by how you say it. Speakers who are clear, concise, organized, comfortable, and confident are perceived as more credible by their audiences. How do you build credibility with your audience? 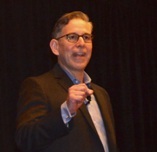 John Capecci of Capecci Communications (Minneapolis) is a trainer and consultant who offers personal coaching, group workshops, and webinars on communication effectiveness.